Once we returned from Bali, the last two weeks of July were mostly about staying local and catching up on things before we were off to Fano at the beginning of August. It took us a few days to fully recover from jetlag, with some very early starts. That first day I can’t say I really felt like being out and about, especially with a mountain of laundry to tackle and suitcases to unpack – let alone the fact that I was up since the early hours – but it does do a world of good with jetlag recovery to get out in the fresh air and sunshine, so that’s exactly what we did, wandering around our nearby National Trust site, Osterley House. 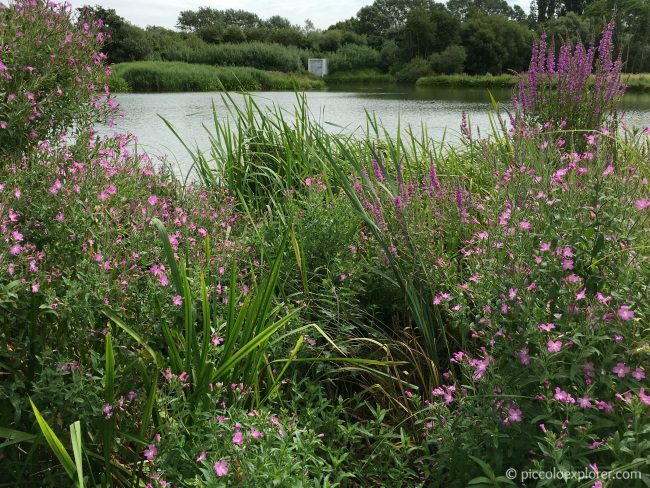 The rest of the month was spent visiting mostly local favorites like Kew Gardens, Duke Meadows Park and the WWT London Wetland Centre, along with what is becoming an annual visit to the Mayfield Lavender Fields. We were there last year right at the end of the season, when half the field was already harvested, so my mission this year was to get there well ahead of harvesting time when the fields were bright purple and we made it. It was absolutely beautiful and truly worth the drive out there! Here’s where we were last month as we settled back into a routine after our long haul trip. For more updates of what we’re up to, you can find us over on Instagram at @piccoloexplorer. And I actually really like the new Instagram stories (sorry Snapchat! ), so do keep an eye out there for some real time updates when we’re out exploring. We ended up having a great time visiting Osterley House in Isleworth, only about 15 hours after we had arrived from Singapore! First, we stopped at the farm stand that, from what I remember, is open on Wednesdays, Thursdays and Fridays. They sell vegetables that they grow at the gardens at Osterley House, along with bags of bird feed that are slightly cheaper than what you’d buy at the on-site gift shop. 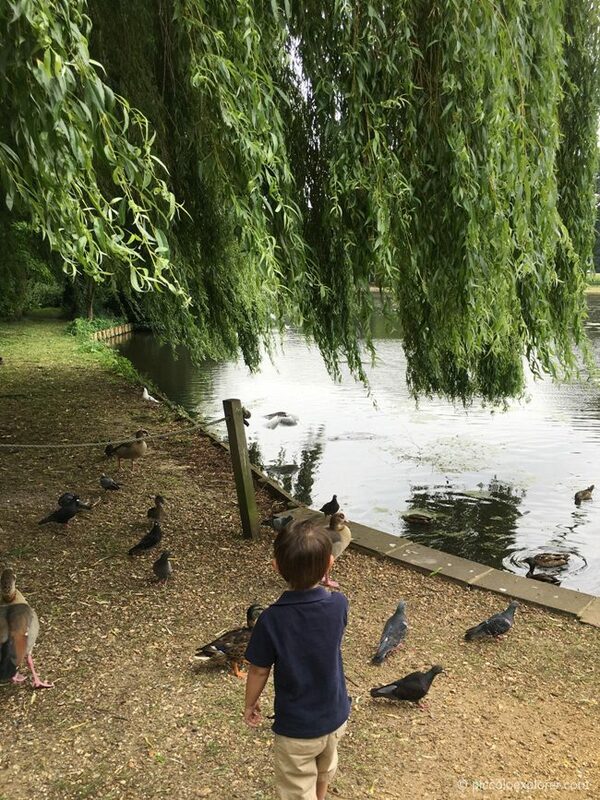 We bought a small bag of bird feed for the day and a large one to keep at home, then set out for the duck pond to feed the birds, where we were quickly surrounded and followed around by a flock of eager pigeons. We picked up a picnic lunch at the café, then ate our sandwiches on a bench near the gardens at Osterley House. 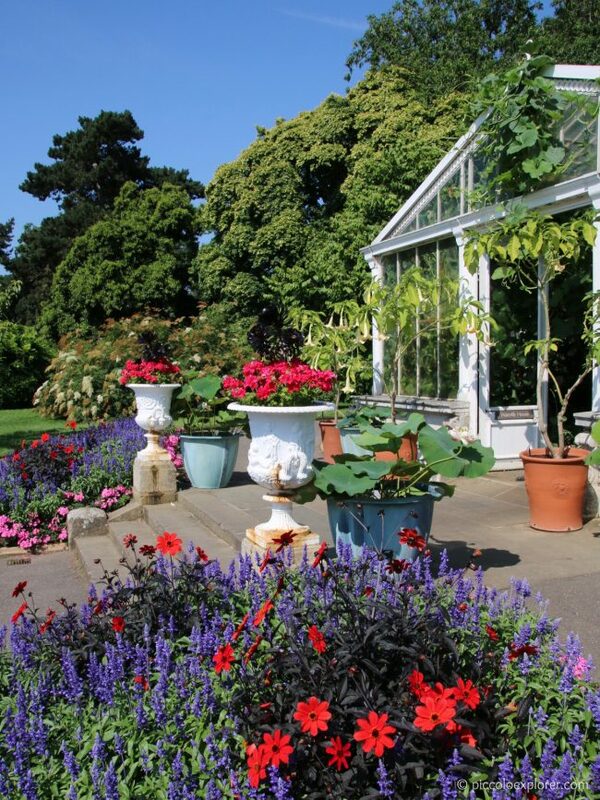 The gardens were looking beautiful, with tall, vibrant flowering plants. We spent a good two hours or so along the play trail, where Little T climbed on tree stumps, dug around the dirt for treasure with sticks then really enjoyed building a den. I’ve been hmming and hawing about signing up for the Friends of Kew membership for some time and in July, I finally went for it. 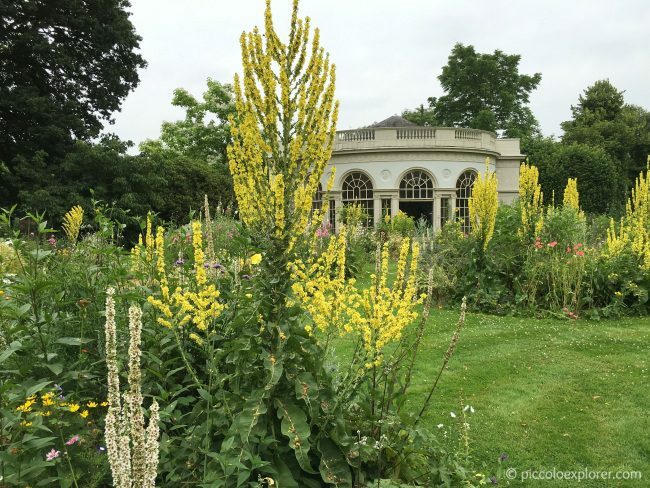 I’m already a member of ZSL and the National Trust, and there are so many places I’d like us to visit in and around London that I was hesitant to sign up for another annual membership, but I’m very happy I did. We’re only ten minutes away and there is a lot to see and do there year round that I can see us visiting more than the roughly five times a year it would take to cover the annual fee – plus, children 3 and under enter free and since my membership includes free entry for a family guest, we can bring Mr. G along too at no extra cost. 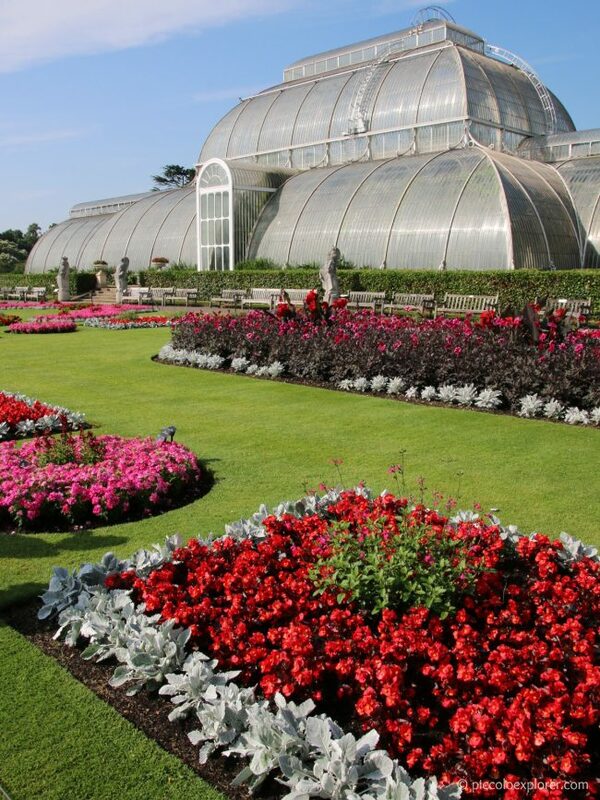 You can now expect Kew Gardens to feature regularly in my Around London recaps! 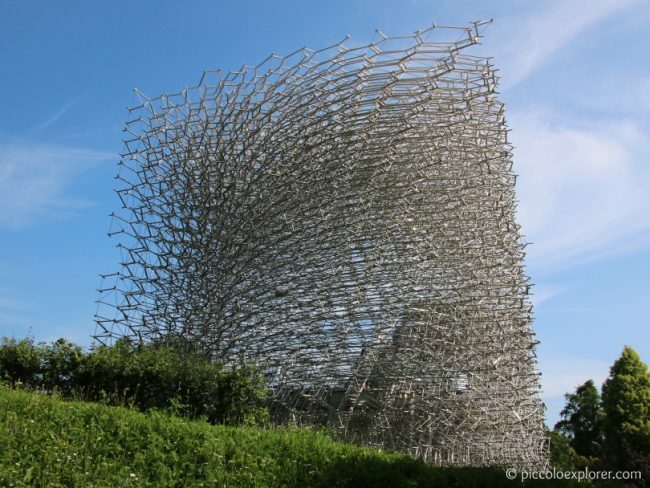 First stop on that day was to see the new installation, The Hive, which is a 17-metre tall, open-air structure that represents the story of the honey bee. 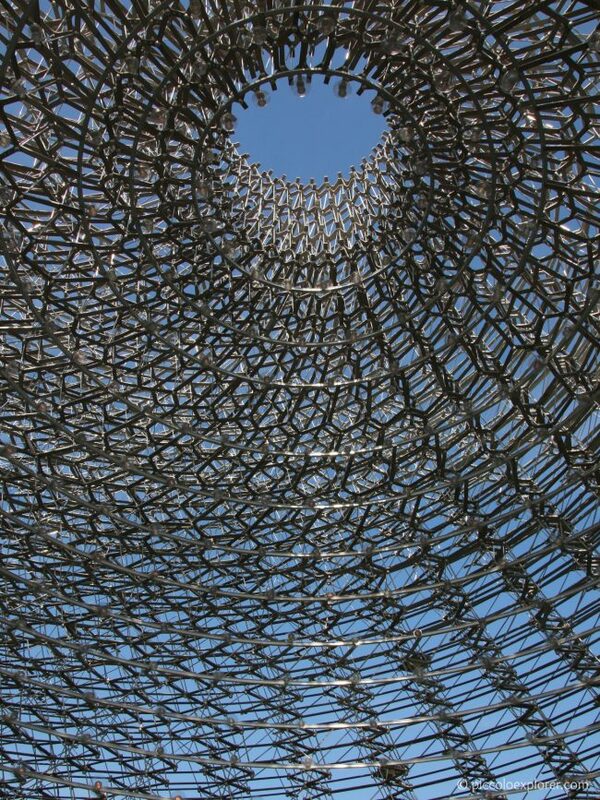 1,000 glowing and fading LED lights are dotted around its core, while a distinct humming can be heard within, which is actually a soundtrack created in response to the activity of real bees in a beehive at Kew. Little T was enthralled with this exhibit, running to the top where you can look down at the people through a clear floor while listening to the gentle hum and watching the twinkling LED lights, then running back down to look up from below. We carried on through Kew Gardens, on what was an absolutely stunning day. 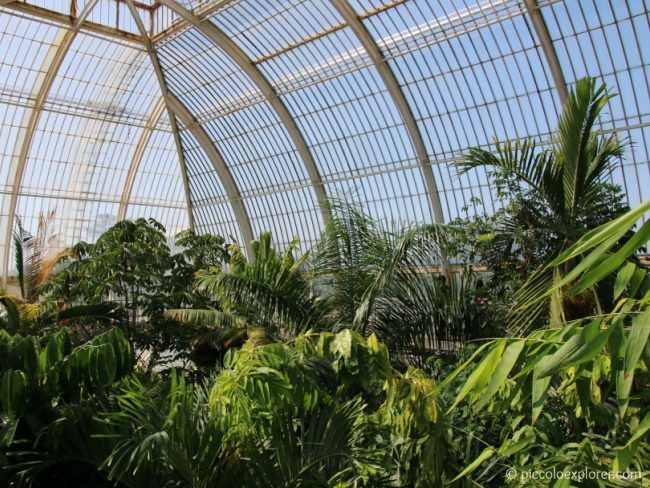 Our next stop was the Palm House, which, with the humidity within the glasshouse and the bright sunshine, was in hindsight perhaps not the best idea, but this was another place that Little T absolutely loved. Even with our previous frequent visits to Kew Gardens, I hadn’t brought him to the Palm House since he was a baby, dozing in his pushchair. Walking amidst the tropical palms was a lovely reminder of our recent trip to Bali and especially the beautiful gardens of our hotel, the Padma Resort Legian. At the Palm House, we visited the downstairs Marine Aquarium, where they helpfully have several small stepladders for little ones to get a closer look at the aquariums, then we headed up to the balcony overlooking the palm trees, one of the highlights for Little T.
The highlight of this month around London was roaming through the lavender fields in Banstead, Surrey. The lavender farm is spread across 25 acres, so although the parking lot was full and it was busy around the fields, we could easily find areas to take our family shots with the purple backdrop looking like there’s no one for miles around. 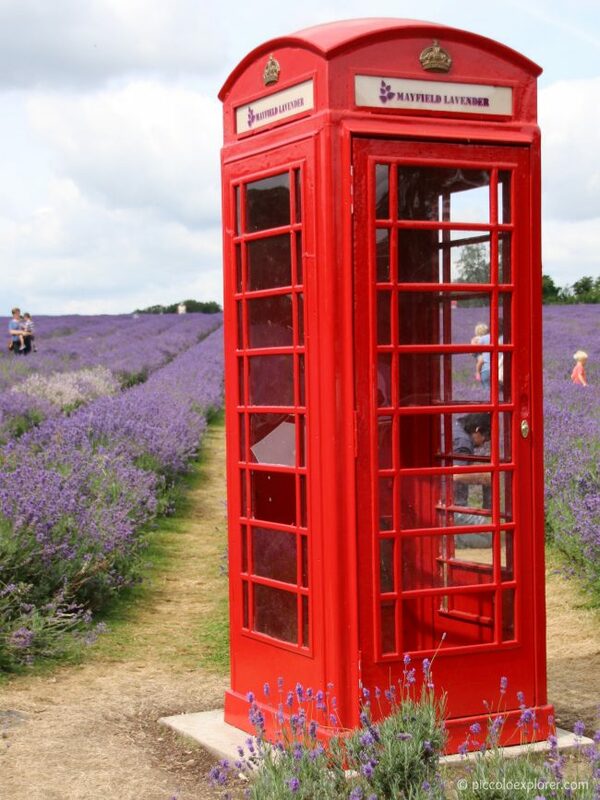 Except for around the red phone box, that’s a popular spot, understandably so as it makes for a unique and beautiful shot! 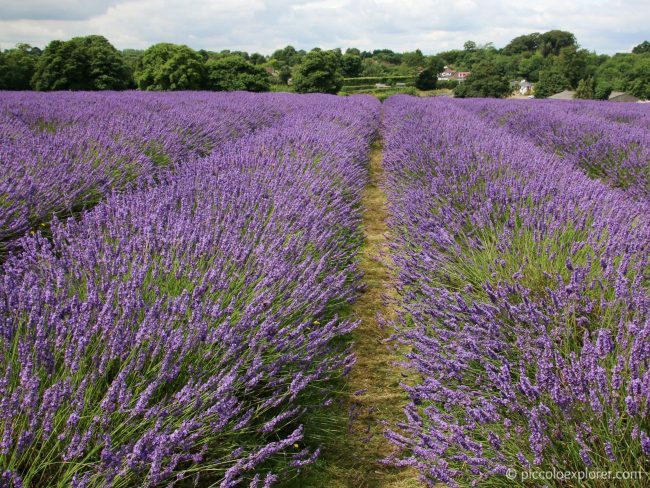 Our family loved the shots I took of Little T in these lavender fields – they were a favorite last year too – and we’ll be back again next year! 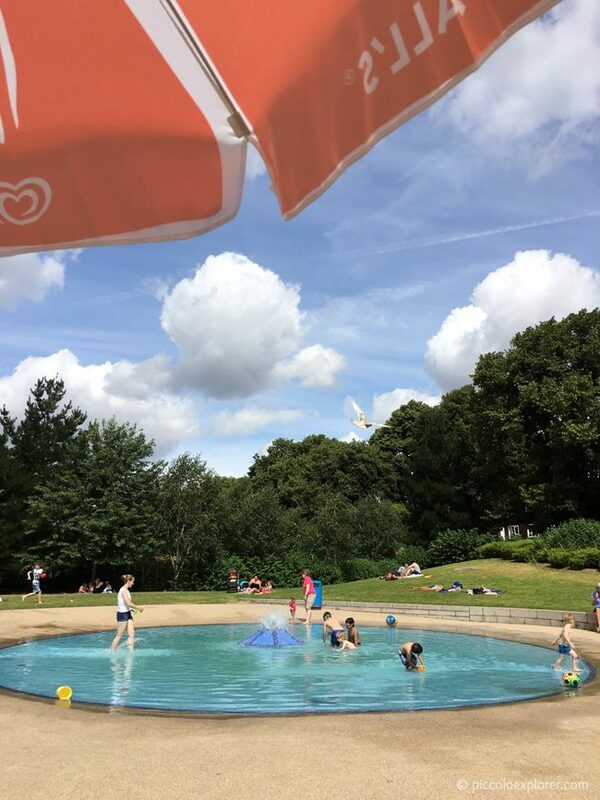 It took us about an hour from West London and again, it’s definitely worth adding to your summer bucket list! This local spot is one I always think we should be visiting more often. This is our third summer living in Chiswick and we finally made it to the paddling pool! It was a fun spot for Little T to splash around in, although the water was a bit chilly even with the sunshine! We had some lunch and I changed Little T out of his pool gear so he could play at the playground next door. 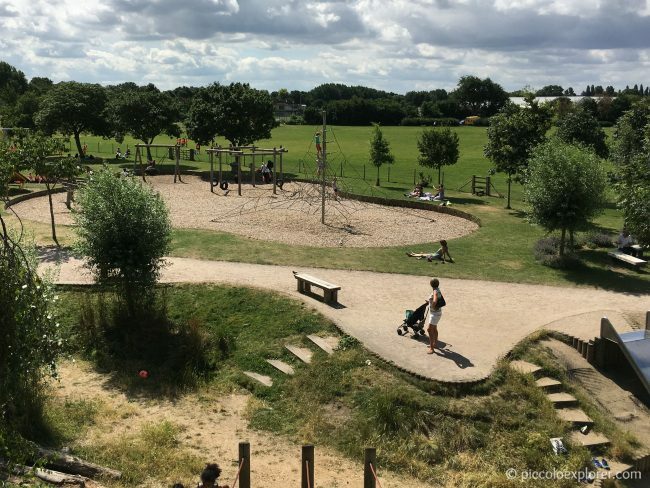 It’s a great playground designed with the input of local children, with a tall slide that Little T absolutely loves! He had a great time running around this place with some friends. And then we spent the rest of the time at the Explore adventure playground, with its fantastic water games. The playground was busy with other kids, I just managed to get this photo of Little T on his own, and he first played at the water table then I put on his swimsuit so he could stand on the splash pad with overhead showers. Each shower would go off intermittently and the children would dash about trying to get under the water first. 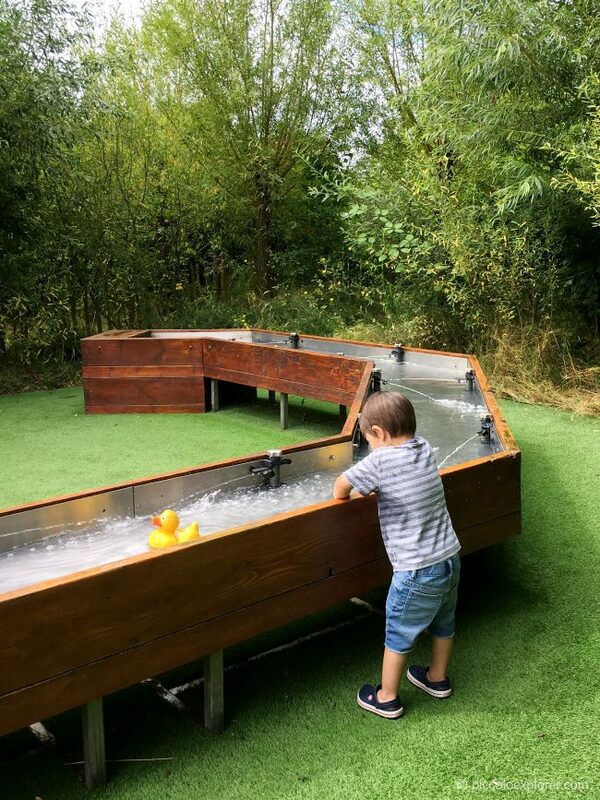 Great place to play and cool down on a hot summer’s day! Counting up until the end of July, we’ve been on 33 days out and 6 overseas trips, including the recent trip to Bali with a short stay in Singapore. 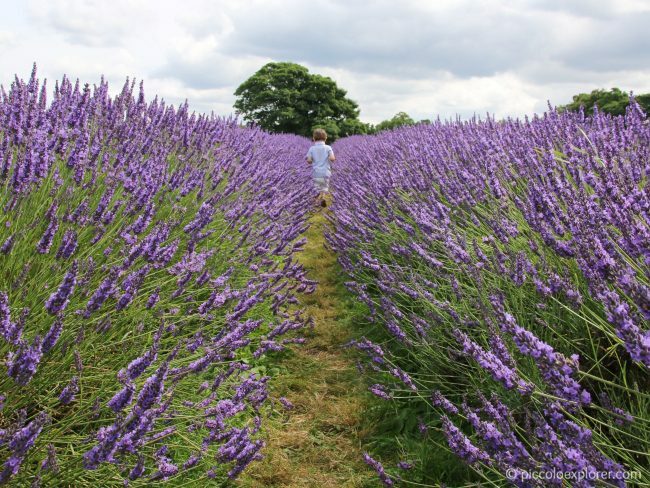 The days out in July were mostly to local favorites with a visit to Surrey to enjoy the stunning lavender fields. We spent nearly two weeks with my in-laws in Fano, Italy, the first half of August, and lucked out with mostly sunny weather and great days to be at the beach, which we certainly made the most of! Before heading to Fano, we made a day trip to the Cotswolds visiting the beautiful gardens of the Hidcote National Trust site. It was a somewhat spontaneous decision and at two hours, more than twice as far as we typically drive for a day trip, but it had me looking forward to more day trips or short road trips further afield. I haven’t made much of dent in my summer bucket list, and I hope to squeeze in some similar day trips during the second half of August. See you back here soon for August’s around London recap! In the meantime, you can follow along on our adventures in and around London on Instagram @piccoloexplorer.